Once again, it's another friends gathering night, and we were discussing where to eat. So when M mentioned that a friend recommended a new place for jajang myeon, I was all for it. Especially since this one is very close to where I live. Hong Ma No is located in a strip mall on 152 Street and 104 Avenue. It's tucked in the end unit, and I probably would have never discovered it if I wasn't looking for it. The minute I walked in, I knew this place has to be decent, because it was packed and 85% of the diners were Korean. I can't help but compare this place with Ma Sarang, it's essentially the same, but this one is slightly bigger in size. Since I tried the sweet and sour pork at Ma Sarang, we ordered on here as well for comparison. I believe this was slightly more expensive($12? ), but the size is about the same. Although the sauce was almost identical, but the meat was different. Ma Sarang used glutinous rice flour to coat the pork which give it's a nice crunchy yet chewy texture, where as this one is just regular flour. The pork was not as tender either, and it was bit over fried. Therefore the sweet and sour pork at Ma Sarang wins hands down. Next up is their Jajang myeon, which all 3 of us ordered it ($7.95). The only difference between J, M and mine is that I asked for the spicy version. When the sauce came, it all looked the same, so it's a good thing they specifically brought out mine later and inform us this was the spicy one. I actually like the presentation here, because you can mix it yourself. This allows you control on how much sauce you want on your noodles. 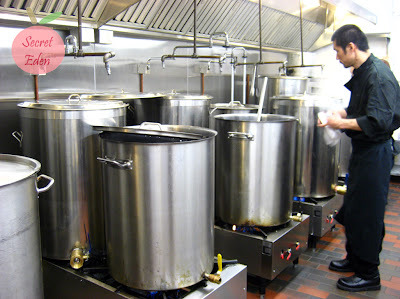 I thought the the sauce was very good, it had tons of mixed seafood, pork and vegetables. 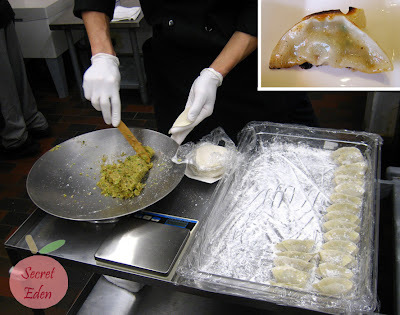 The sauce was rather liquidy as well (comparable with Ma Sarang) which indicate they did not use starch to thicken it. Also my spicy sauce was indeed spicy, especially when I ate the left over the next day. The noodle were soft but still had a bite to it. Although all 3 of us thought the noodles were good, but M (who is Korean) preferred the ones at Ma Sarang better. 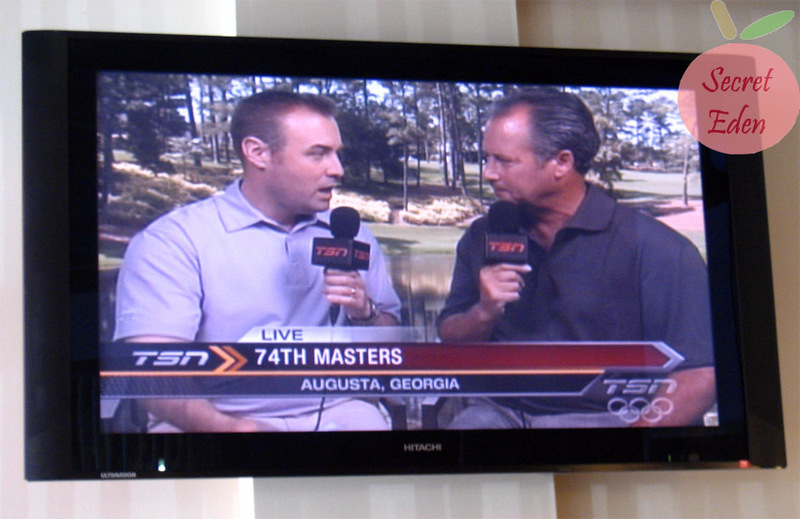 I personally thought they were equally good. In general, I am very happy that I found this place. Because now I don't have to travel all the way to Coquitlam for good jajang myeon. In terms of which place is the winner, I will have to say it's still Ma Sarang, only because their sweet and sour pork was better. However since Hong Ma No is really close to me, I think I will probably end up going there way more often than Ma Sarang. I haven't seen my friend (K) for a long time, so finally we both managed to find some time to hang out. Because we set the time to meet after lunch, so I ate at home prior to going out. However K didn't eat anything, so that lead us to a question, where should we go for some afternoon snacks with lots of choices. Since we were already heading towards Metrotown, K suggested Pittsburg restaurant in Crystal Mall. Since we arrived after 2:30pm, they handed us a special afternoon tea menu. You got to admit, the prices are cheap. This also includes a hot drink as well. I was tempted to order from this menu, even though I ate already. In the end, K went for the Curry Beef Brisket with egg noodle. The portion was good for only $6.50, but it went downhill from there. The noodle was too soft. The soup was rather watery (not rich at all). In fact it tasted like water mixed with curry powder. The beef brisket was a too chewy as while. Although I was tempted, but I was also quite full at the same time. So in the end, I decided to utilize my other 'stomach' and ordered dessert instead. I got the waffle with fresh fruit for $5.75, which also included a hot drink. Despite the nice presentation and the cheap price, I was disappointed with this dish. The waffles were way too thin and crunchy. I don't think there is any leavening agent used in the batter. The ice cream had that artificial strawberry taste. The only good thing was the melons, they were relatively fresh. Service was also lacking. When we first walked in, all the servers were seated at a table chatting and eating. So they just told us to sit anywhere we like. They came to take our order and brought our food, and then never came back again. I can tolerate bad service, poor ambiance, but the food has to be good. In this case, food quality is definitely not there. Although it may be cheap, but it's not really worth it. Also the service was not good either. With that combination, you can certainly count me out for a revisit. 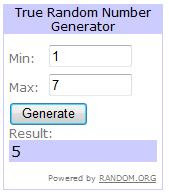 This post is seriously over due. I actually went to Dulcinea Cafe about a month ago right after the mediocre meal at Lime. Dulcinea is conveniently located on Denman right next to Qoola, so it was easy to find, parking on the other hand was the hard part. The minute you walk into the shop, there is a sense of coziness. It has primarily wood structures with soft warm lighting. Luckily the tables on the raised platform were empty, so we got a nice view of the whole restaurant. I had a hard time deciding which drink I wanted, because there was this tea that caught my eyes, but this is after all a chocolate cafe. The tea I was contemplating is called Picasso ($3.85). It had pear, melon, kiwi, pink rose bud, white chocolate shaving and lemon. The owner took out the tea for me to smell, I was sold immediately. It had a fruity scent with a hint of rose. The tea without honey was a bit sour, I am guessing it's from all the fruit bits, but after adding just a bit of honey, it was delicious. In the end, I liked Dulcinea Chocolate Cafe for 2 reasons. The drinks were mostly good, and the place smelled heavenly. I think what really won me over is the ambiance, it has a relax and cozy feel to it. It's the kind of place where I would go on a cold winter day. With that being said, I hope they have good cold drinks too, as summer is right around the corner. I usually start every post with a score for food, service and price, but this post I only scored the food. The reason is that this meal was special, because this was a cater dinner organized by Chowtimes. It was the first dinner of their Eight Great Traditions of Chinese Cuisine event (8GTCC). They have extended the invitation to their readers to join them on this quest to taste the 8 great Chinese cuisine. 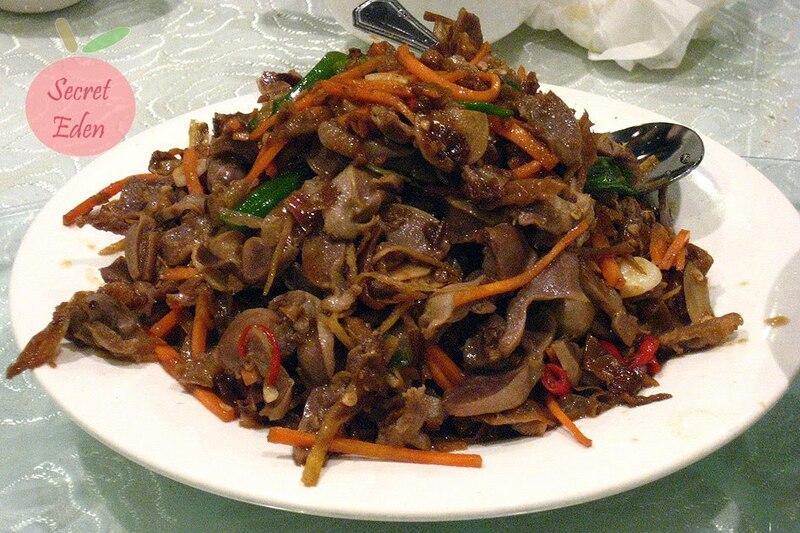 The 8GTCC teams has decided the first dinner was going to be the Xiang cuisine (aka Hunan cuisine). 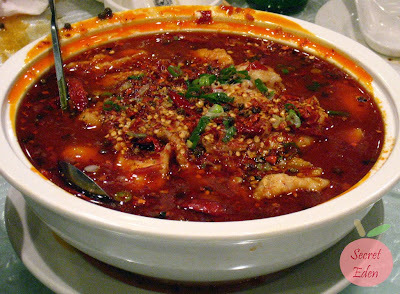 The Xiang cuisine is known for it's liberal use of chili peppers. They also tend to use lots of garlic and shallot. The main difference between Chuan (Sichuan cuisine) and Xiang cuisine is that Chuan uses lots of peppercorn, thus resulting in a very numbing effect. Xiang on the other hand is just simply spicy. 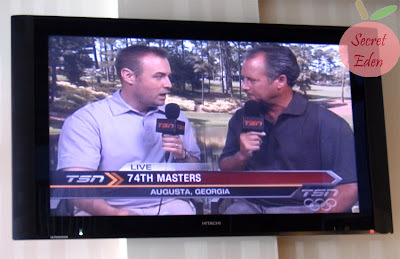 After much research, Chowtime and the 8GTCC team has decided on Alvin Garden for this event. What started as a idea for a small group of people, turned into a mega event where a total of 52 people attended, that's the power of Chowtimes readership. So it's a good thing that the restaurant was relatively large. The reason I did not list the price for this place is because our meal was predetermined, thus the price was a steal. We had a total of 5 appetizers and 12 dishes of only $20/person (tax and tip included). First up is two appetizers: Hunan pickled daikon/carrot, and spicy dried bean curd with celery. The pickled daikon were great, it was crunchy and spicy. I don't really like bean curd nor celery, needless to say, that for sure was not my favorite dish. 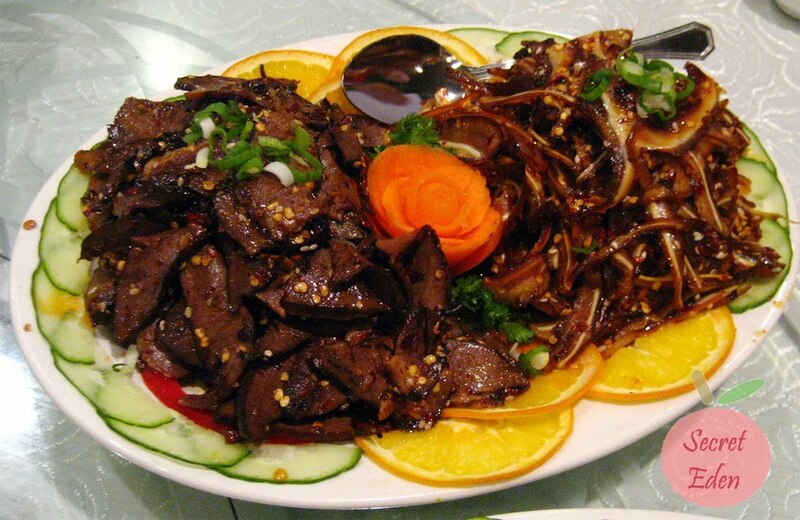 Next 2 appetizers are the 5 spice pork heart and spicy pork ear. 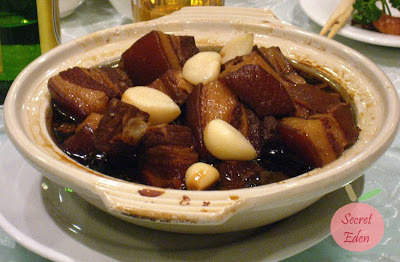 R loved the pork heart, the meat was like extremely lean dense pork and quite chewy too. The pork ear was good, but way too spicy. After only about 2 bites, I was seriously heating up. The last appetizer was the tea smoked BBQ duck. This apparently also won an award and I can see why. The meat was tender and flavorful with a nice smoked flavor, I will definitely order this again. The restaurant sponsored a free soup to go with our meal. 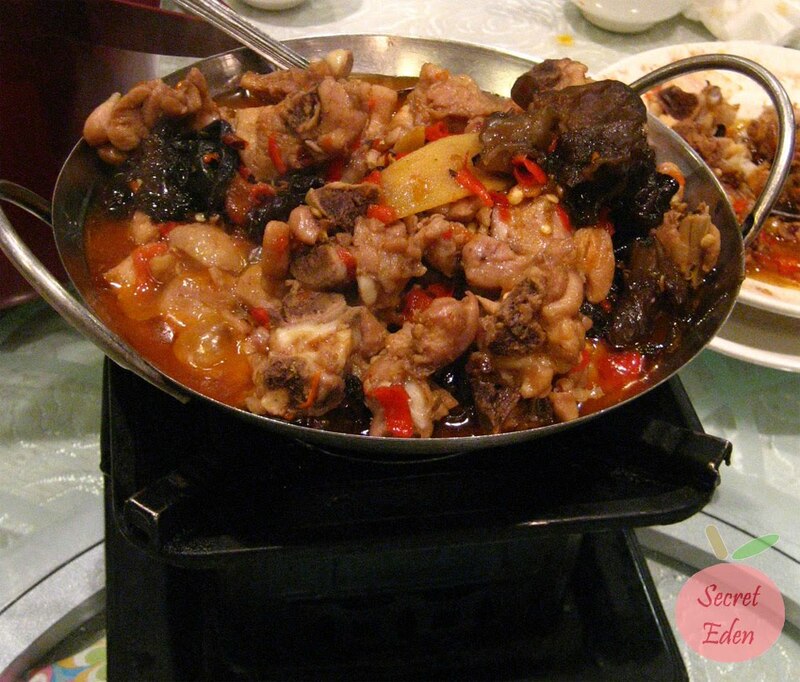 It was a one of those traditional Chinese soup that is cooked in a clay pot that take 3 hours to make. The soup had rich meaty flavor from the pork bone and a distinct sweet flavor from the corn. 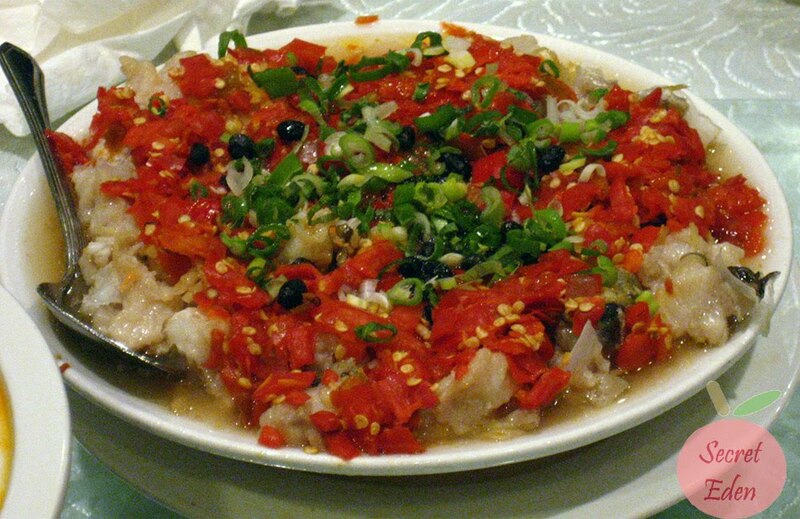 First dish of the night is the Dongting boiled fish. This dish looked scary spicy, but really it wasn't that bad, as long as you don't scoop too much of the chili pepper up. The fish slices were tender and good, it absorbed enough flavor, but still was not too spicy. This has to be one of my favorite dish of the night: Hunan Brasied Pork. The pork was packed with sweet soy flavor. The fat part just melt in your mouth. I highly recommend trying this is you are not scared to eat the fat portion of the pork. This is the free ranged chicken with ginger. There was a distinct ginger flavor, which should be obvious by this picture. Steamed Lingcod heads in chili sauce was very good as well. I find the meat on fish head are usually more tender than the body, and this also is the case here. The chopped chili pepper was actually not that hot, it adds a good kick to the dish. Pork belly stir fried with jalapeno was overall a good dish. The pork was really thin, so it absorbed the flavors well. Actually I am not too sure if it's jalapeno, because it wasn't too spicy. 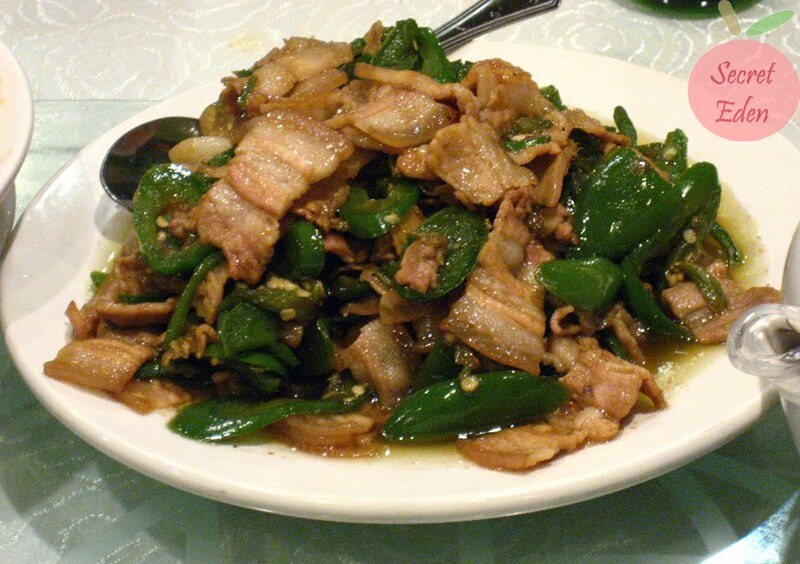 The stir fried garlic bolt with smoked pork was good. The garlic bolt was crunch and the meat was chewy. You know, I thought this was a Chuan dish, but maybe I am wrong. This was R's favorite dish of the night: chicken giblet with Hunan white chili. This was by far the spiciest dish of the night. The white chili are extremely spicy, but it's such a rush to eat this. This is the kind of dish that once you take a bite, you will want another. All I can say is prepare to drink a lot of water or eat a lot of rice if you plan to order this dish. I think the Cumin lamb was the biggest disappointment for me. Usually the cumin lamb is stir fried to a point, there are no oil or sauce left. 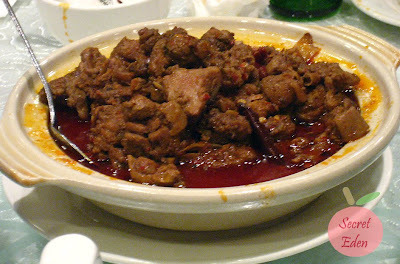 But this lamb came drenched in oil/sauce. There was a distinct cumin flavor, but something was lacking. This is our hot pot of the night: chicken with Hunnan chili and vinegar. This was okay, nothing too special. 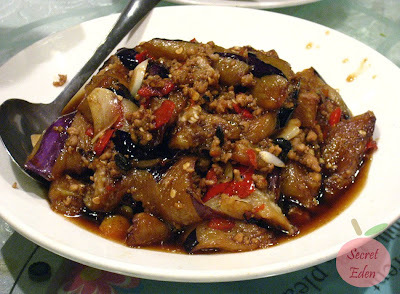 The eggplant with garlic and chili was also another favorite of mine. The eggplant was soft but infused with lots of garlic and chili taste. This sauce would be perfect on rice. 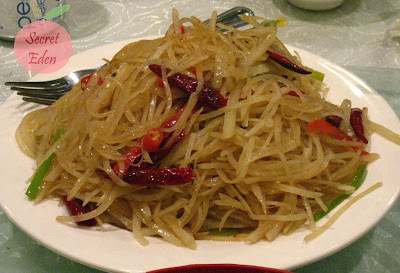 The last dish we had was the spicy and sour stir fried potato shred. This was not bad, because the potato retained it's crispy texture. Congratulations to the winners, if you send me your address today, I will mail out the certificates tomorrow. 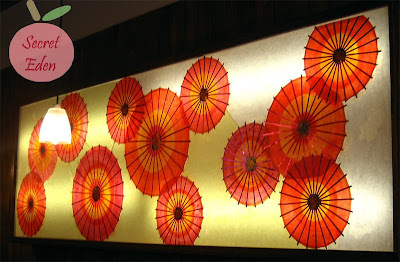 Our last blogger meet up was at East is East, and we had a huge turn out, all thanks to Sherman. And this time, all thanks to Kim, we had another huge turn out. Here are all the bloggers in attendance: I'm Only Here for the Food, Food and Tell, Le Petite Foodie, Me Plus Food, Tastes Better with Friends, the Friday Lunch, Omnomics, Sherman's Food Adventures, Vanfoodies, Victoria's Food Secrets, and Yum-o-rama. After contemplating the menu, the majority of us wanted to try the fest platter ($80 for 4 people), since it pretty much included all the meat items on the menu. However, when the waitress told us the special: any schnitzel with beer for $15, R was tempted. In the end, we still went for the platter. When you got to a Chinese restaurant where combo meals are not served, you better go with a group of people. 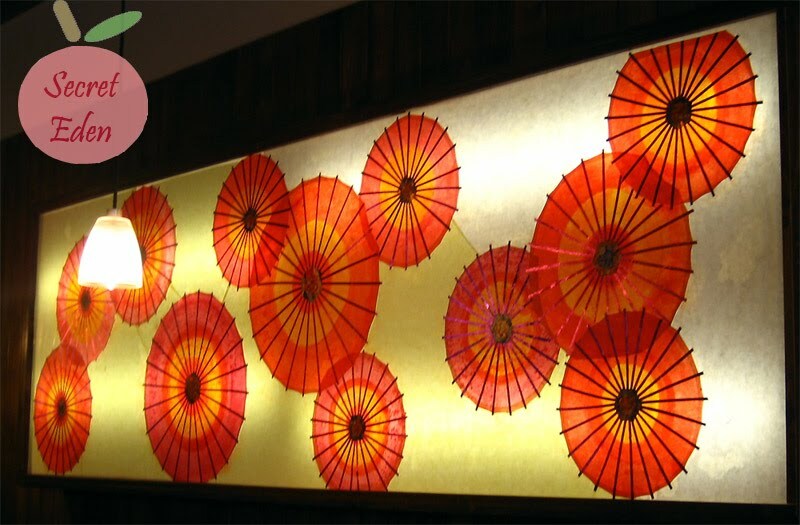 This way you can order a wide variety of dishes and sample way more food. For that reason, R and I rarely go to one of these. Finally we got the chance, when R's friends suggested this place, and we had a total of 6 people for that day. I find it funny that Golden Great Wall Szechuan really is not a Sichuan cuisine restaurant, but they have it in their name. If anything I think they are more of a Shanghai cuisine restaurant. Regardless, they do serve a good variety of Chinese dishes from all the major provinces The first thing we ordered was the Peking duck 3 ways (~$34.95). 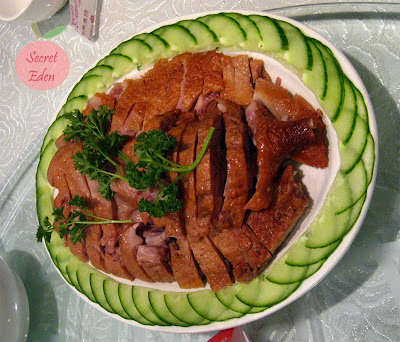 The first way of course is the duck skin wrapped with sweet sauce and scallion. The skin was crispy with a fine layer of oil still retained in between. Therefore although it was crispy, it was a bit oily too. My only complaint was that there isn't enough flour wrap for all the duck skin we had. The 2nd way the duck was prepared was sauteed duck meat with lettuce wrap. 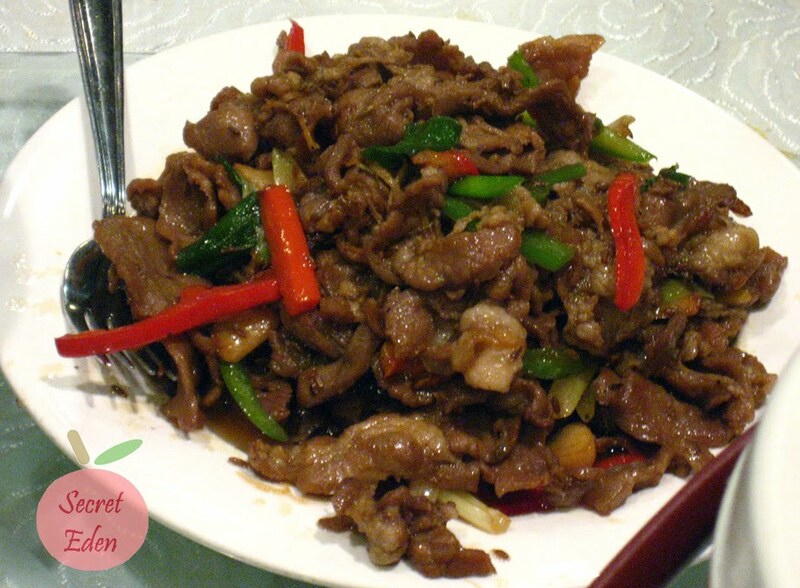 The duck meat was juicy and flavorful, you would also use same sweet sauce in this wrap as well. However eating this created a big mess. The sauce was dripping everywhere, and the stuffing was falling out, simply because the lettuce was too crispy. Now I am not really complaining about the lettuce, as I like them crispy, it just a warning that this dish can get messy fast. 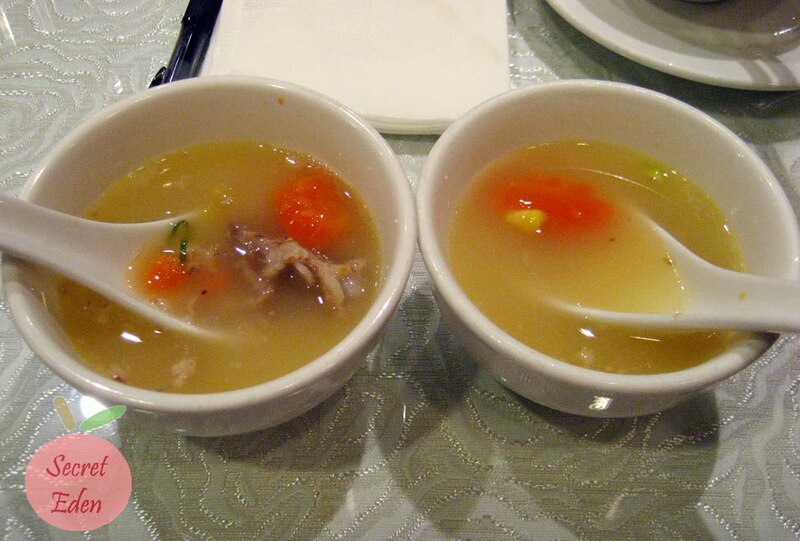 The 3rd way the duck was prepared was the duck bone soup with tofu and Chinese cabbage. The soup was flavorful with a hint of BBQ duck flavor. Also it wasn't too oily either. 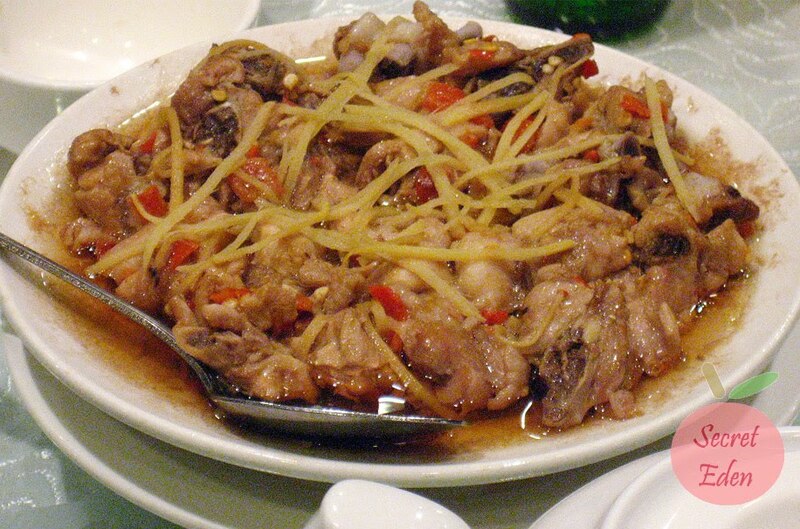 I picked the pork hock (~$15.95), cause I simply love the glutinous skin. However this one was a disappointment, because the skin was too tough. Usually it would melt in your mouse (oops correction 'mouth' lol), but this required a lot of chewing. Also the lean portion was also not soft enough either. Despite the meat being too tough, the sauce was actually good, it was a nice balance between the soy sauce and rock sugar. The traditional Shanghai dish, minced pork ball (~$12) was good in my opinion. However some others did not like it. The reason I like it was because the meat was very tender, to a point it's almost questionable if it was fully cooked. I was totally fine after eating this, so I am going to say it was fully cooked. The pork balls were not simply all pork, they also had water chestnut mixed in. The deep fried "squirrel" fish (~$17) with sweet and sour sauce tasted a lot like sweet and sour pork. I did not particularly care for the sauce, but that was not the biggest problem with this dish. The biggest problem is that the fish was too heavily battered, when I bite into it, there were almost no meat. Also it was over fried, as the coating was rather hard. 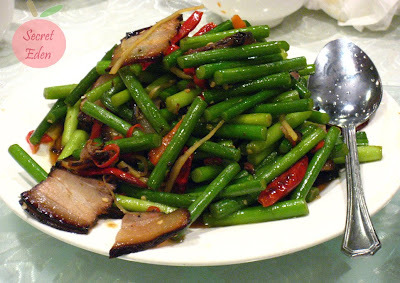 After all the meat, we got a plate of garlic stir fried Gai Lan (~$9). Although this was a simple stir fry veggie dish, it was very well done. The vegetable retained it's color and crunchiness. 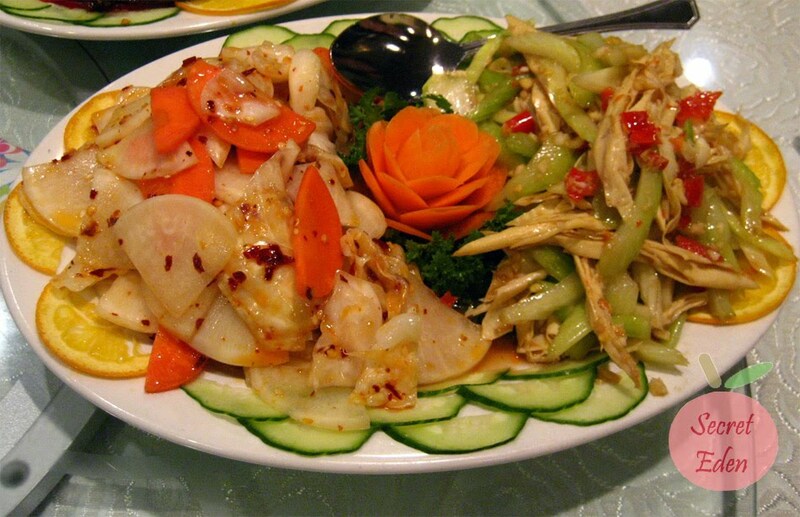 The vegetable was cooked with chicken stock as well, so it has that rich flavor with a medium garlic taste. Lastly, we had to get a basket of Xiao Long Bao, because I simply love them. Here at Golden Great Wall you get 10 for around $7.95. 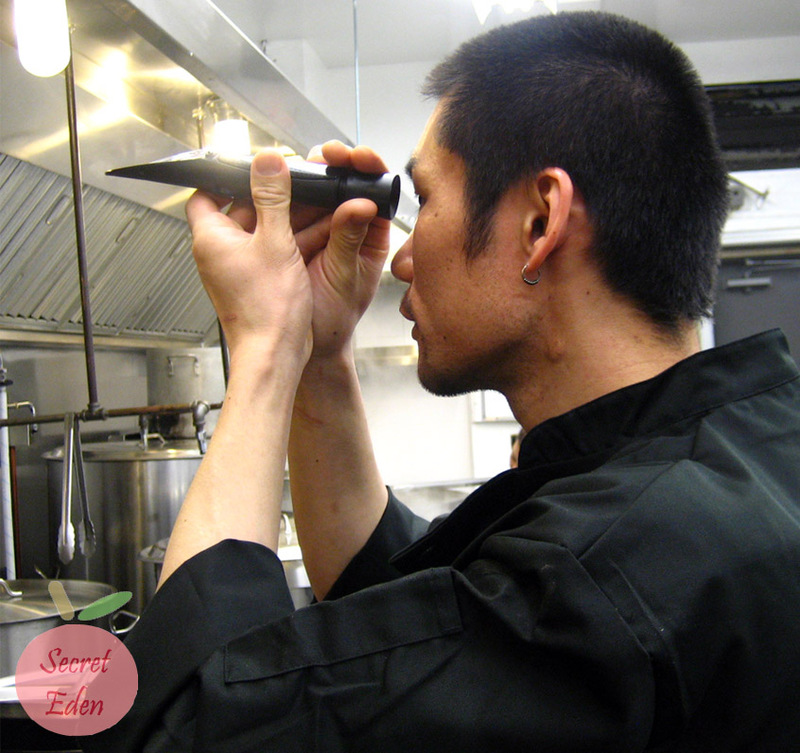 The skin was very thin, so you have to be really careful picking them up. It was also loaded with soup. The stuffing was a little hard in my opinion, too much starch. Other than that, these were great. Overall, we were satisfied with our food, and happy with the service. Although the prices were slightly higher than other places, but given the decor of the place, you would expect to pay that price. In the end, I would come back, but there are also tons of other Chinese restaurants in the area, which I think I will explore first.